This apartment, lighted by three large windows, fully renovated in 2011, consists of 1 double bedroom with a large private bathroom and a living- room of 430 . with 2 sofas (one double bed). the Marais: Once a swampy area, the Marais became important from the fourteenth century, thanks to its proximity to the Louvre, the favorite residence of Charles V.
It reached its zenith in the seventeenth century when it became the favorite area aristocracy. Splendid palaces were built, the hotels, which still dot the Marais. This apartment is in the perfect spot. It is in the middle of the Marais area, one block from the best outdoor market in Paris-Sundays and Thursdays. My wife and I were originally going to stay at a friend's place in Paris, but they had to cancel the afternoon before we were scheduled to fly to Paris. We found this wonderful apartment on VRBO and called the VBRO office for assistance. They started the rental process quickly over the phone and the owner responded and accepted our rental in less than 1 hour! Our vacation was saved. 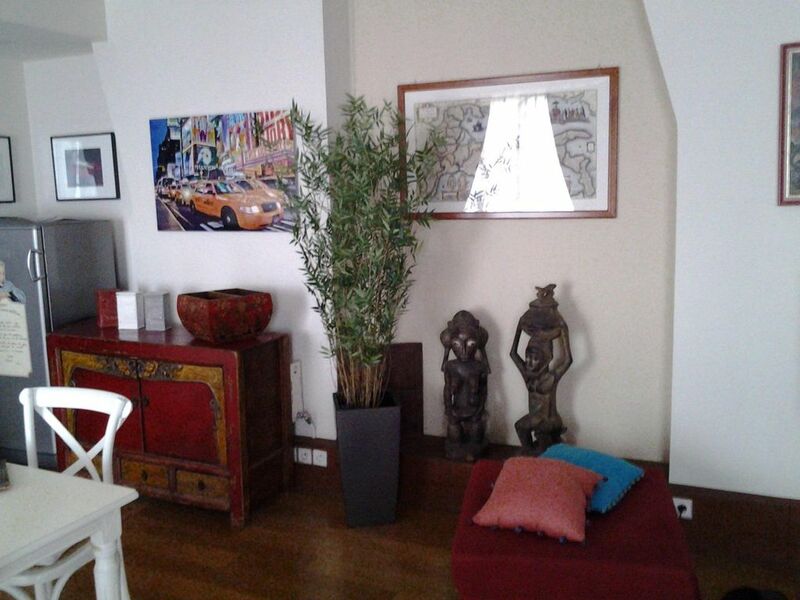 This apartment is large by Paris standards, has 2 full bathrooms with showers, washing machine, modern kitchen appliances and a really comfortable bed. It is in the very heart of the Marais neighborhood, but because it overlooks a private closed-in courtyard it is quiet. We have stayed in numerous VRBO in Paris and this is by far the best. It is 1 block from the Bastille, therefore you have access to several metro lines and 8 different bus lines including the #69 bus that will take you to many of the main sites in Paris. The wine/liquor store downstairs carries the best selection of wines you will find anywhere in Paris. We ate wonderful dinners at two restaurants right across the street and another just three blocks away. This is really a great Paris VBRO value. Perfect Paris. A quiet retreat on a VERY busy street but it is on a courtyard, away from the noise. You can buy a Harley Davidson, a baguette or an excellent bottle of wine within two blocks. Restaurants everywhere, food stores, three metro stops (that we used), an outdoor food market two days a week and a very secure building. Two bathrooms, a very large living room, great kitchen, clothes and dish washers, two towels heaters to dry the clothes. . We spent three weeks there. Comfortable and we even entertained. The owner answered every question right away, it had a lift. What more can I say but, great place! This apartment is well kept, on the fourth floor (European third floor), with an elevator. The property manager, Madam André, was there to meet us when we first arrived around 9:30 pm on a Friday evening. She does not speak English, but as we spoke French, there was no problem. Both she and the owner were very responsive to several of our concerns. With the exception of the shower, from which you must be very careful getting out else you can slip, it was an enjoyable stay. Advantages: Spacious, fully equiped, comfortable bed, quite considering location (unit faces a court yard that blocks noise from the main street), elevator, very secure (three locks to get to the apartment), building assistant very helpful, one block to underground and fantastic, block long outdoor market on Sunday and Thursday, walking distance to the Seine. My just concluded stay couldn't have been better, or more rewarding and this apartment and its location were a major part of my excellent stay. Much of what I'd say has been said by other reviewers. The apt is spacious, well equipped, lots of comfy furniture, a good bed, two baths and an aesthetic that is very pleasing. Living at the nexus of the 4th a, 10th a, and 11tha is an ideal location. Good transportation. Walk to a lot. Excellent 'new' chefs in the 11th, very good food. Don't miss Will. Like many ohers, I will return to Mariapia's wonderful abode on next visit. And, I had no problems at all with M. Andre. The apartment was just as described and really pleased with it. Good location close to the Metro and a great restaurant called Tambarin (spelling might be wrong) and a bakery about 50 yards away. Madame Andre was great. My French was terrible but we figured it out and she was very kind and accommodating. The Google translate that she had on her phone helped both of us. It was very hot during our stay as it was about 90 deg F, and the two fans helped but still pretty hot at night, which is normal as nobody has air conditioning. Be careful if you have never used the trains as we got ripped off at the Bastille train station to the tune of over $100 by someone impersonating a Metro employee that was "helping" us buy our train ticket for the family for 3 days. Card would not work, so paid her cash instead of putting cash into the machine. We got a one way train ticket for 4 of us worth about 7 Euros for what we paid her for a 3 day ticket for the 4 of us and discovered that we got ripped off hours later when we tried using the same ticket to return. They had credentials on a lanyard, but their uniform didn't match the real Metro Employees, but we didn't know that as new travelers to Paris using the train for the first time. After that, no issues and the trains were phenomenal. 150 mt from Place des Vosges (one of the most charming squares in the world where Victor Hugo lived) 200 mt. from . the Bastille, in front of Marais, an ideal location for exploring Paris. Two underground stations within 200 mt. : Bastille (lines 1-5-8) and Chemin Vert (line 8).